Win, and nobody is too bothered about tactics or team selection. How much of the selection was down to 'niggles' for Gylfi, Leon and Montero and how much was the prospect of games Fri-Mon-Thurs coming up I don't know but this result helped to back up my thoughts that we have one of the strongest squads outside the big 6. As things stand the whole 'big 6' thing is in a state of flux but deeper squads could have a real bearing on where teams stand after 1st Jan. The difference between brave and foolish is often a fine line but Monk was correct in believing that the side selected was good enough to beat a struggling Hull side. A second goal would have been nice to kill the game off (Shelvey coming close a couple of times) but generally speaking Hull created relatively little. Ash made a huge number of clearances for example but if you look at their location, most are well outside the box or at least nowhere particularly near the goal. More often than not, Hull just seemed to put the balls into areas where it was easily cleared and although Fabianski made a couple of good saves, he wasn't overly troubled. 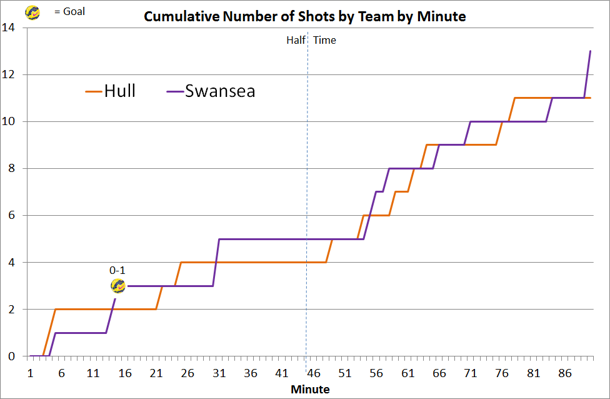 Shots by Minute - Hull's last shot came in the 78th Minute, although after the ending of the Spurs game, I didn't feel comfortable until after the Final whistle. A first away win in the league since the opening day of the season sees us with a 10 point gap over the relegation zone. Looking in the other direction, the possibility of a Chelsea-Spurs league cup final could see an extra Europa league place become assigned to the League. If the FA Cup final was also between two of the top 6 in the league then 7th place could be good enough for a Europa League spot. 7th is a stretch target but not something that should be thought of as out of reach.